Michael Crews Development covers the gamut when it comes to affordable new homes in Escondido for move-up buyers. For current homeowners looking to move up, Michael Crews Development offers a variety of single and two-story homes throughout North County ranging from 2,071 square feet to 4,164 square feet with 4 to 5 bedrooms, up to 4.5 baths and up to 6-car garages, starting in the $600,000’s. Need an immaculate kitchen for house parties? Michael Crews Development’s floor plans have gigantic kitchens that are open, inviting, functional and entertaining. Have a new addition to the family? Need more room? Concerned about good schools? Check out the Gretna Green neighborhood in Escondido. It’s zoned for some of the best ranked schools in North San Diego County! The gated Royal View neighborhood has a beautiful Heston floor plan with a bonus room AND a swimming pool that is perfect for families. Homeowners who demand quality prefer Michael Crews Development because each new home comes with brand name appliances and a customer service guarantee. Using only high quality building materials and award-winning vendors and contractors, Michael Crews Development is and always will be North County’s Local Homebuilder. Be sure to ask about the current Trade Up incentive. It’s available at Michael Crews' current Escondido real estate including El Norte Park, Royal View, Cityscape and Gretna Green in Escondido; Sunset Heights in Vista and Match Play at La Costa in Carlsbad. Sales Offices are open daily at Cityscape in Escondido from 9 a.m. to 6 p.m. Offices are also open daily (except Thursdays) from 10 a.m. to 6 p.m. at Center Stage, Gretna Green and El Norte Park in Escondido, and Sunset Heights in Vista. Royal View and Match Play are available to tour by appointment. To get to Center Stage, from I-15 in Escondido, exit at Via Rancho Parkway and head east. Via Rancho Parkway turns into Bear Valley Parkway. Take a left at San Pasqual Valley Rd and another left on Idaho Avenue. Center Stage is a few blocks up on the right side. To get to Sunset Heights in Vista, from I-15, exit on Highway 78 west. Take 78 West to Vista Village Dr. South in Vista. Turn right on Hacienda Dr., then left on Melrose Dr. Take another left on Las Palmas Dr. Turn right on Vale View Dr. and then right into Sunset Heights on Hidden Sky Ct.
To get to Cityscape, from I-15, exit on Valley Parkway east. Turn right on Midway Drive. The Cityscape neighborhood is on the right side of Midway Drive at the intersection of Grand Avenue. To get to Gretna Green, from I-15, exit on Via Rancho Pkwy/Bear Valley Pkwy east. Turn right on Canyon Road. The Gretna Green neighborhood is at the intersection of Canyon Road and Gretna Green Way. To get to El Norte Park, from I-15, exit on El Norte Parkway and head east approximately 3 miles. The El Norte Park neighborhood is on the left side of El Norte Parkway at the intersection of Midway Drive. Call the Sales Office at 760-751-1212 for more information. 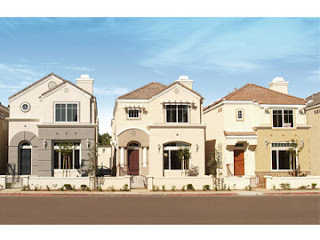 You may also visit us online at http://www.michaelcrews.com/ to tour new homes and sign up for our weekly e-newsletter.